The crossover market is exploding, and CUVs with three rows are getting more popular as buyers with families look for options that can fit the kids and more adults. We first saw Infiniti’s planned entry in this segment last year when they unveiled the all-new Infiniti JX concept at the Concours D’Elegance at Pebble Beach. 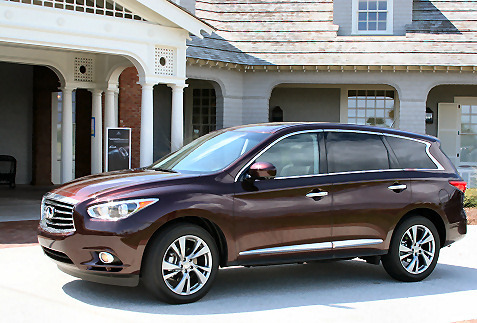 We were impressed then with the look of this all-new vehicle, and last week we had the opportunity to drive it at the Infiniti drive event in picturesque Charleston, South Carolina. The new JX is targeting buyers with kids who don’t want to sacrifice luxury and style, filling a gap in Infiniti’s crossover and SUV portfolio. The designers also emphasized space and flexibility in the interior along with cutting edge safety features. The exterior of the JX looks sleek and stylish and is consistent with the design language we’ve come to expect from Infiniti, including the distinctive LED tail lamps. It’s a far cry from some of the boxier or bulkier vehicles from competitors that sport three rows. One new feature that we’ll be seeing more of is the crescent shaped rear side window which adds a nice touch to the vehicle. Overall, the look is a real winner that should be a huge hit with the target market. Infiniti engineers focused on space and flexibility with the interior, with particular emphasis on easy access to the third row seats. They created a mechanism that lets the second row seat tilt in a manner to provide the most space, and another to allow users to tilt the seat even when a car seat is strapped in (without the baby of course!). Not having to remove the car seat is a significant convenience for many parents, and adults can easily get in and out of the third row, so grandma will happily jump in the back with the kids. Third row air conditioning was also added, along with two DVD monitors for second row passengers. Throw in Bose technology with the speaker system and you have a luxurious experience for the entire family. The technology packages are impressive, and the My Schedule feature lets you coordinate your Google Calendar with the map and other functions in the vehicle. So you can set an appointment on your PC calendar and then just instruct the vehicle to “map it” once you get inside. Very convenient! This should be even better once they come up with an app to coordinate all of this. The new JX was not engineered to be a performance vehicle, but rather was built for the target market with sufficient and competitive horsepower. I had the chance to push the vehicle at higher speeds and it performed just fine with solid acceleration and solid handling. Moms and dads driving the car certainly won’t have any complaints. It’s in the safety area where Infiniti has come up with some impressive innovations that will certainly please the target customers. The Backup Collision Intervention is something you’ll be seeing in the commercials for this vehicle. Basically, if you’re backing up at low speeds, the sensors will pick up something behind you or an approaching vehicle and stop the car for you even before you notice the hazard on you rear view camera. I had the opportunity to test it and it worked great. The key is that the driver is going no faster than five miles per hour backing up, but this should do if for most backup situation in the driveway or in a parking lot. Another helpful feature lets alerts the driver if someone or something is right next to the vehicle. Infiniti has nailed this one and it should do very well in this segment. The JX is an impressive vehicle and it has all the luxuries buyers will want, and some they didn’t realize they need.